Due to the rejigging of the racing calendar in 2017, all the marquee sprinters are down in Abu Dhabi, so this weekend will be totally dominated by the hard men of the classics. It’s also been upgraded to World Tour status, for the first time, not that it’s lack of official status has ever diminished the quality of the field or the perceived value of the win. You know that the season has reached the spring classics when the route maps look like a toddler has been let loose on it with a packet of crayons. The ‘Omloop’ of the Flemish Ardennes begins and finishes in Gent, which it has done since 2007. The riders will head south of the city and the race won’t really start until the run up to the Haaghoek, which kicks off the cobbles at 51km. Then we have four Hellingen over 15km: Leberg at 54km, Berendries at 59km and, newcomers for 2017, Tenbosse at 63 and Eikenmolen at 69km. The riders will then head south eastery in order to tackle the famous ‘Muur’ which, to many purists’ delight, has been reinstated into this year’s Tour of Flanders. It is one of the most iconic climbs in cycling and, even though it appears early in the race, expect the road up towards the Chapel of Our Lady of the Oudenberg to be packed with Belgians. The riders then turn back west and take on the Valkenberg before entering the second section of the race. The Haaghoek is then tackled for the penultimate time, just after the halfway point of the race. The bergs and cobbles sectors then become more frequent with nine (four cobbles and five bergs) coming in just 42km. This is the part of the race where the final group will likely be produced and all eyes will be on Tom Boonen when the race hits the Taaienberg at 139km. There are three things certain in Belgium: Death, Taxes and Tommeke attacking on the Taaienberg. After this Eikenberg and Wolfenberg will be key for anyone wanting to pull back the attacks. If there is a strong group still away at the end of this then it’s almost game over for the riders still in the peloton, barring any mechanicals or crashes for riders in the lead group. The race will then be full gas over the next four cobbled sectors, including one final ride over the Haaghoek. The riders tackle the Leberg for a second time at 157km and then the final climb of the Molenberg, back for 2017 after road works ruled it out for 2016, at 163km. These will serve to sap the legs just that little bit more before the final 35km of cobbles and road towards the finish line in Gent. The final section of cobbles comes at 178km then it all depends on how big a gap the lead group has before the final cat and mouse attacks begin, before either a solo break for glory or a handful of riders sprint for the line. All of the main cobbled classics contenders will be racing; however, a win doesn’t usually mean success at the later cobbled monuments of Roubaix and Flanders. The last rider to win here and go on to win one was Johan Museeuw in 2000 (Omloop Het Volk and Paris-Roubaix). We look at ten riders who will be hoping that success here doesn’t follow that 16-year trend! Greg Van Avermaet had his best year to date in 2016. He returns to the race that kicked off that memorable year and as defending champion, he could match Ian Stannard’s feat of winning back to back titles. He has shown decent form in the early season, picking up a couple of top ten stage finishes at both Valencia and Oman, but this is his first real test of the season. He has solid support from his BMC teammates in the shape of Daniel Oss, JP Drucker, Martin Elmiger and Floris Gerts (who won the junior race in 2015 – a name for the future). There are very few races that Peter Sagan enters that he isn’t expected to win, and this isn’t one of them. He found it hard to match the raw pace of Caleb Ewan at the Tour Down Under, where he finished second to him on three occasions, but he is back in his natural habitat wherein raw pace alone won’t cut it. Last year he delivered on the promise surrounding him and the monuments, by winning the Tour of Flanders, and he followed that up by retaining his World Championship title. He is a man that never seems to require a solid team to help him get results, but he nevertheless does have Marcus Burghardt and Andreas Schillinger as senior statesmen to help him early on. He finished second her to Van Avermaet in 2016 and will want to go one better this year. After two great seasons as a pro rider, 2017 should be the year that Tiesj Benoot takes his first major one day win. He was heralded as the next Boonen after his fith place finish at the 2015 Tour of Flanders, but a DNF in the same race in 2016, shows that luck, as well as talent, is needed to win a spring classic. He showed on the uphill finish at stage five of Volta Algarve, that he has decent legs at the moment. A typically strong Lotto-Soudal team are here to support him, including backup Jens Debusschere, with the sole non-Belgium being young Brit James Shaw. The winner here in 2012 Sep Vanmarcke has since been tagged as ‘the unluckiest man at the classics’ tag, with either having to settle for the podium or having a mechanical at just the wrong time. A new team for 2017, could be the antidote to that and a win here would also suit Cannondale-Drapac too, who have been historically slow at winning early on in the season. After effectively racing at Volta Algarve and Valencia to get kilometres in the legs, this is his first real race of the season and he has good support from the like of Sebastian Langeveld, winner in 2011, and Taylor Phinney Phinney injured his knee on a recon ride, Ryan Mullen takes his place. He has arguably been the strongest rider in the classics in recent years, but his luck has been horrendous – now’s the time to turn it around. Alexander Kristoff has started this season as he had the previous two, by picking up wins in the Middle East before heading to Europe for the classics. However, it’s unclear to us as to who will lead Katusha here, as he has favoured Kuurne-Bruxelles-Kuurne in previous years. He had a monument-less year in 2016, after winning Milan-San Remo in 2014 and Tour of Flanders in 2015, so he will want a strong performance here and perhaps let either Tony Martin or the young Belgium Jenthe Biermans take centre stage at Omloop. Jens Keukeleire didn’t have the greatest of weeks last week. He was hit by a car whilst out training in Spain and feared a broken collar bone. Thankfully this wasn’t the case, but it will have knocked him a bit. He has always shown potential but never made the step up to be the main contender, however, it does seem that good thing come to those who wait at Orica-Scott, none more so than last year’s Paris-Roubaix winner Matthew Hayman, who will ride in support of Keukeleire. As well as the three big engines of Tuft, Durbidge and Bewley. In 2016 Edward Theuns carried on the form he showed at a pro-conti level, with Topsport Vlaanderan, with Trek-Segafredo. He finished eighth both here and at Kuurne-Bruxelles-Kuurne, the later was won by his fellow country and team-mate Jasper Stuyven and the two of them line again for opening classics weekend in 2017. He was mixing it up in the sprints at the Tour Down Under, so he has good legs. Whilst he’s an outsider for the win, it wouldn’t be a huge surprise if he pulled it off. Sky will come here with joint leaders in the shape of Luke Rowe and Ian Stannard. 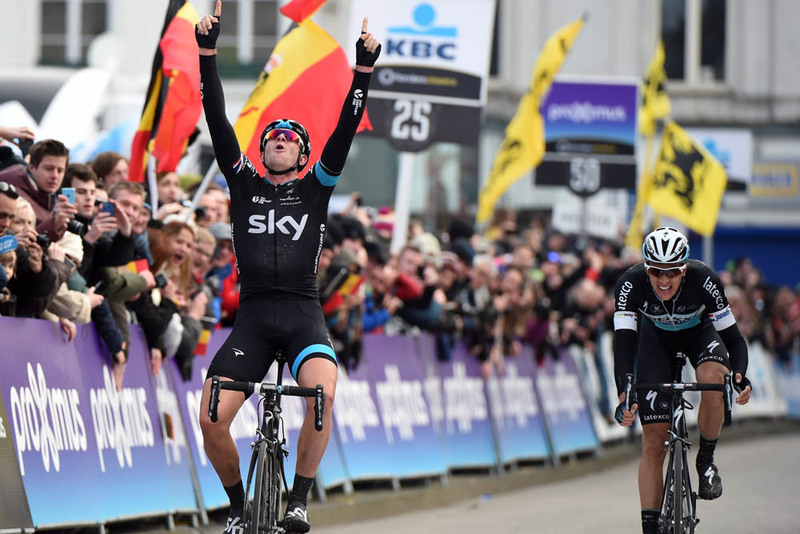 We’re going for the Welshman here, with Stannard openly targeting Roubaix and Flanders. Rowe finished fourth here last year and has been one of Sky’s strongest riders at these races. With fellow countryman Geraint Thomas focusing on GC races the door is wide open for Rowe to take his first big win at Omloop in 2017. Another Belgian product of the Topsport Vlaanderan, Oliver Naesen joins AG2R after IAM Cycling folded last season. Arguably, his senior compatriot, Stijn Vandenbergh, would be the favourite for the Franch team, but we don’t rate his racing brain in the heat of the moment, as previous years have shown. Naesen and possibly young french rider Alexis Gougeard, who finished fifth here last year, would be our picks, however this will be a decision that will be made out on the road.